Sorry for the late post today. I swear whenever it rains, I just get extra sleepy for some reason. As much as I love the rain, it's so dreary to look at and makes me want to go into sleepy mode. 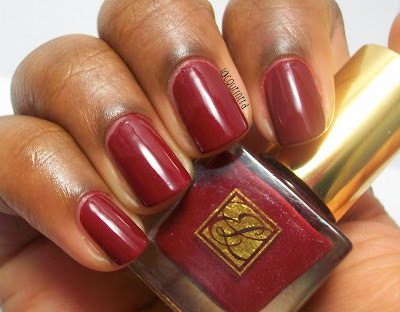 I have a swatch of Estee Lauder's Black Wine for you today. I tried to use this in a nail art design, but it failed. Luckily, I took pictures of this beautiful color before I did the design. The funny thing is that I didn't know that this was an Estee Lauder polish to begin with. Lately, I've been rummaging through my girlfriend's nail polishes since she can't wear it for her job. I really liked this color so I took it home with me, but it just took me so long to realize that it was Estee Lauder and that the name was on the back of the bottle the whole time. Silly me lol. Black Wine is a dark blood red. This is two coats without a top coat. It's literally similar to the color of red wine. The formula was a bit on the thick side, but once it smooths out it's good to go. The application was good with this polish as well. It came in a really small bottle, so maybe it was also in a set of polishes. Unfortunately, I don't have that many details about this polish to be honest. I tried doing some research on it online and didn't come up with any results. Even the Estee Lauder website didn't have it on their main polishes section, so my guess is that this polish is discontinued. It's a shame because it's a really good polish. On the other hand, Estee Lauder polishes run for $20 each, so I know that I probably won't be buying this brand any time soon. 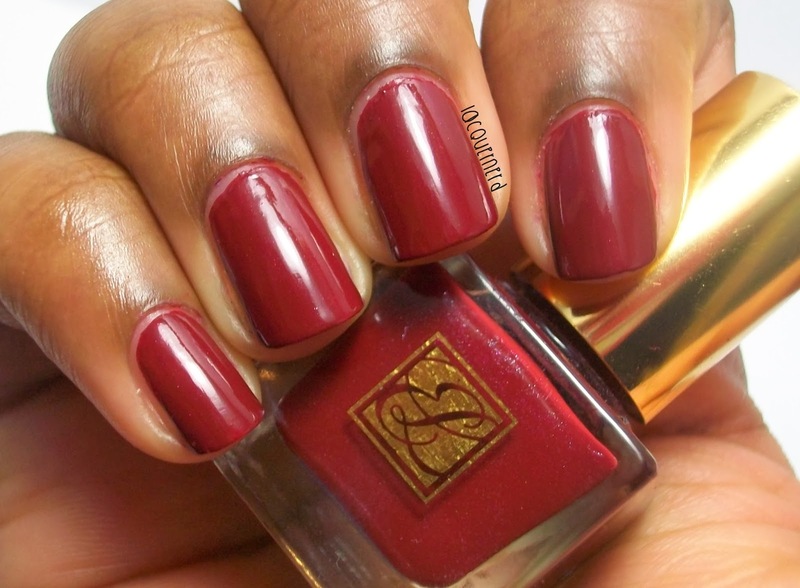 Overall, I really liked this polish but the brand is way too expensive for me. 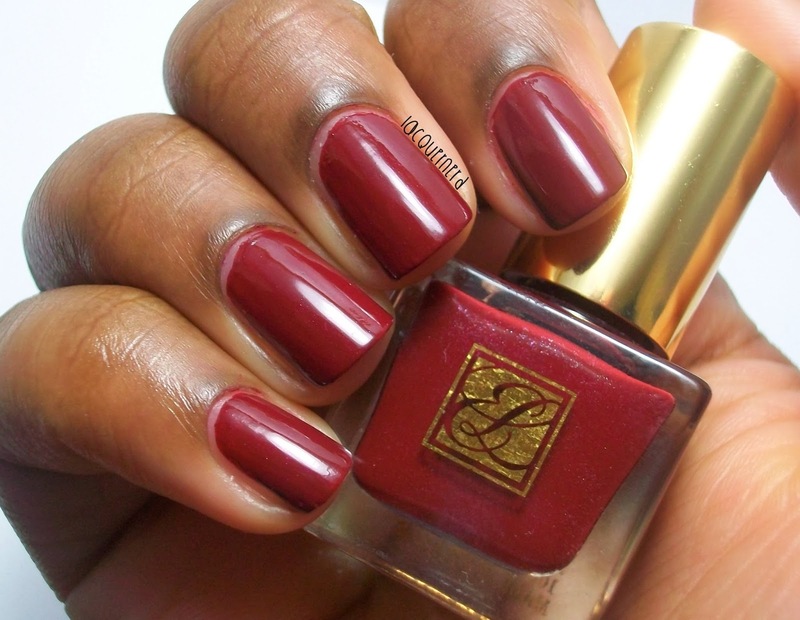 I probably won't be buying any Estee Lauder polishes anytime soon. I'll settle with this polish for now. What do you think of this polish? How much is too much for a polish? Thank you! I'm really glad you like the blog!